Noah Gomez of Archbold runs the ball in a game against Bryan this season. The Bluestreaks moved up one spot to ninth in the latest computer rankings for Division V, Region 18. 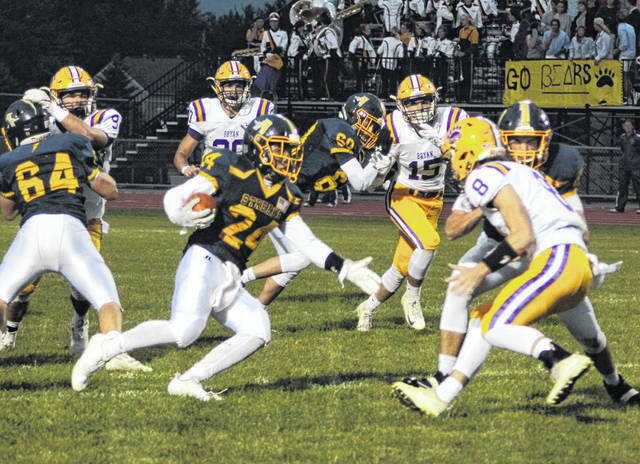 Archbold moved up one spot in the latest edition of the Ohio High School Athletic Association football computer rankings that were released earlier this week. The Bluestreaks (5-3), after getting back on the winning side last Friday versus Delta, moved up to ninth in Division V, Region 18. The top eight teams make the playoffs. Archbold is at Evergreen (4-4) tomorrow and Swanton (2-6) the following week to end the regular season. Region 18 – 1. Liberty Center (8-0) 16.9867, 2. Genoa Area (8-0) 15.8125, 3. Anna (6-2) 15.2125, 4. Marion Pleasant (7-1) 14.7875, 5. Oak Harbor (7-1) 13.1901, 6. Elyria Cath. (6-2) 12.95, 7. Richwood North Union (6-2) 11.7203, 8. Casstown Miami East (6-2) 10.2875, 9. Archbold (5-3) 10.2375, 10. Millbury Lake (5-3) 10.025, 11. Ottawa-Glandorf (4-4) 9.65, 12. Pemberville Eastwood (6-2) 9.5125.